» Characters from DFW #12: INDIAN JOHN SEATTLE — by Monte Herridge. Characters from DFW #12: INDIAN JOHN SEATTLE — by Monte Herridge. #12. INDIAN JOHN SEATTLE, by Charles Alexander. This next installment of my columns for Mystery*File features a look at another series character who appeared in the pages of Detective Fiction Weekly. 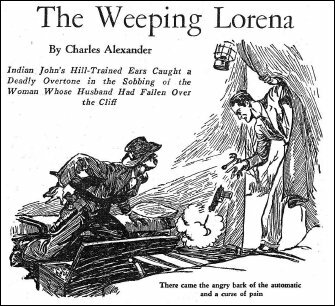 The “Indian John Seattle” stories by Charles Alexander made up a short series of at least fifteen stories published in DFW from 1933 through 1939, plus two stories in Ace-High Detective Magazine 1936-37. The stories are rural in setting. Stories published in DFW were a mixture of settings, both urban and rural. Many stories took place in urban environments, but there were a large number that were rural in setting. The Tug Norton series by Edward Parrish Ware was one that had stories in both urban and rural settings. Ware’s Ranger Jack Calhoun series was mostly rural, with a little in small towns. Even an urban series such as Morton & McGarvey by Donald Barr Chidsey had some stories in a rural environment. Minton does not always approve of the way Seattle does things. Seattle, by contrast to his deputy, was “a bandy-legged figure in worn moleskins, wearing a time-honored Stetson, …” He is slightly bent from much time in the saddle, although he regularly uses an ancient Ford automobile he calls Flap-fender. No mention is made of any family of Seattle’s, nor is it known where his home was. He kept odd hours as sheriff, and was likely to turn up making the rounds of the town of Plainview at 3 A.M. He seems to have lived for his job. 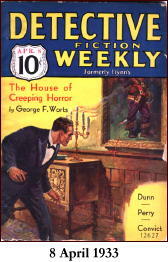 In “Head Hunt” he tracks down two murderers and finds the missing head of their victim, meanwhile avoiding a death-trap. Seattle carries an old .45 Frontier Model Colt, and certainly knows how to use it. However, they find that Sheriff Indian John Seattle is no fool as he quickly uncovers their scheme and crime. This story reveals that Seattle has no confidence in the abilities of his deputy, Minton. Seattle mentions that Minton is usually the first on the scene of the crime, but the last to solve the crime. In “Death Watch,” Minton actually interferes with Seattle’s attempt to uncover the crime and fasten the guilt where it belongs. There were other series in DFW about rural sheriffs who solved crimes. 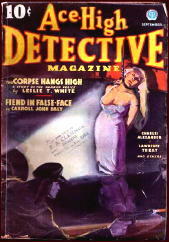 One of these was the series about Sheriff Whitcher Bemis, written by Harold de Polo and published in DFW from 1927-1928. De Polo also had another rural sheriff series in DFW: Sheriff Ollie Bascomb from 1931-1941. Both of de Polo’s series have a bit of humor in them, and the Whitcher Bemis series attempts a rural dialect for the characters. The Sheriff Indian John Seattle series is different than these two series primarily in having no humor present in the stories, and presenting the sheriff as a person of dignity, and not just a hick sheriff. “Death Watch” involves another criminal who thinks he can outsmart Sheriff Seattle, and tries to kill him when his plans are failing. However, the criminal overlooks a simple thing in his plan, and it comes back to point the finger at him. In this story, Seattle actually kills one of the criminals. Usually he prefers to catch them alive for trial, although a number of times he has to wound the criminal in order to get his man. One of the better stories in the series. In “Claws of the Killer” the two murderers think they have a good plan by killing someone and claiming a wild bear did the crime. However, Sheriff Seattle manages to capture both and point out a large flaw in their scheme. 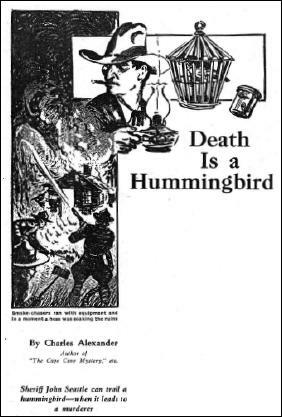 “Death is a Hummingbird” involves a bizarre and very improbable method of murder that I have not seen before. Using hummingbirds to start fires! An absurd idea. The story basically falls apart, and Sheriff Seattle uses a ridiculous bluff on the murderer to make him confess. 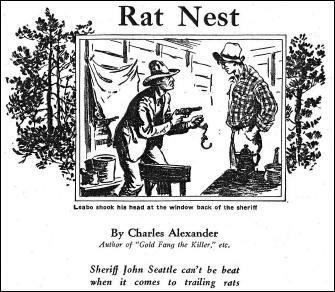 In “Rat Nest,” a much better story, Seattle is investigating some poachers, and when he arrests one of them for murder he winds up making the biggest mistake of his career. However, when he investigates further, he learns the truth behind the matter. In “Deputy Sheriff Rattlesnake” the murderers kidnapped Seattle and placed him in a death trap, from which he escaped. However, while he was missing, deputy sheriff Minton and the coroner argued over who should be sheriff if Seattle did not show up. So it sounds like he was feared, but not missed. This was an average series of stories compared to the many other series that ran in DFW, but it is better than the two rural sheriff series written by Harold de Polo. I prefer the series without much humor in it, compared to the humor present in the de Polo series. 9. THE PATENT LEATHER KID, by Erle Stanley Gardner. 10. OSCAR VAN DUYVEN & PIERRE LEMASSE, by Robert Brennan. 11. INSPECTOR FRAYNE, by by Harold de Polo. There are something like 45 stories by Charles Alexander in the Cook-Miller bibliography of pulp detective fiction. Most of them appeared in DETECTIVE FICTION WEEKLY, but a small handful appeared in other magazines, such as ACE-HIGH DETECTIVE MAGAZINE. Issues of the latter, by the way, are very hard to find today. It doesn’t help much to search for information about the author online. Both his first and last names are far too common. The only appearances of “Indian John Seattle” that Googling brings up are this article by Monte and references to it. The stories about the good sheriff were read and enjoyed at the time — else there wouldn’t have been so many of them — but since then, I think it’s safe to say they’ve been long forgotten. Until now! An interesting article about a forgotten writer. I don’t recall ever reading anything by Charles Alexander. DFW with a weekly schedule and over 900 issues, was a motherload or minefield(if you do not like them), of these type of stories. I don’t know how close Monte might be to doing a piece of Ranger Jack Calhoun, but I’d like to read more about him, too. I’m somewhat relieved to know that you don’t remember any of Charles Alexander’s stories either. You have more copies of DFW than I do, and what’s more you’ve actually read many of yours. The fact is, though, I don’t remember any Indian John Seattle stories, and with a name like that, you’d think I would, if I had. I will eventually write a piece on the Ranger Jack Calhoun series in DFW, which has 65 stories from 1926-1938. Calhoun is promoted to the rank of Inspector part way through the series, although his job doesn’t seem to change any. There are plenty of series in DFW, and many of them are forgotten by most readers. Some of the series are good, others are just average and forgettable.